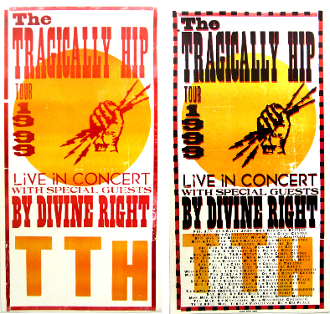 2 poster set (1) Tragically Hip 1999 Tour - with colors 1-2 (2) 3rd color - final poster printing progression. Tragically Hip 1999 Tour. Poster measures 13 1/4 x 25 1/2. Both posters have dinged corners, but nothing major. 1.5 Medium condition. Ships ina tube.